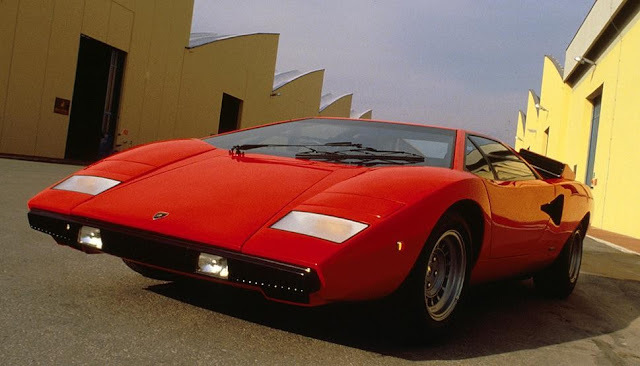 The Lamborghini Countach was styled by Italian design masters Bertone. In its first incarnaton, the Countach flew to a top speed of 186mph. That was more than impressive in the '70s. Its classic Lamborghini V12 engine produced 375bhp. Subsequent models output still more power. Handling-wise, too, the Countach was well up to snuff. Mid-engined as it was, its gearbox was at the front - nestled snugly beneath the banana seats. As a result, the Countach's cornering capabilities soared. A 5-speed transmission only added to the fun! Countach is a Piedmontese exclamation/expletive. In its mildest form, it simply means 'wow' ... though it can have fruitier connotations! The first definition, at any rate, is spot-on. Later versions of the Countach, though, over-egged the stylistic pudding somewhat. Pointless spoilers - and over-sized wheel-arches and ducts - bordered on the kitsch. To be fair, by the time such models hit the showrooms, the firm's founders had departed. Indeed, it was in large part due to the Countach that the Lamborghini logo stayed afloat. When it made its début - in '74 - the Countach stunned show-goers. Lamborghini's rivals were pretty shaken up, too. Over the course of its run, then, the Lamborghini Countach summed up the Seventies ... a decade which veered wildly between masterpiece and parody.